Most former sporting venues leave something in the collective memory of the community in which they used to be based. However, when I noticed the grave of the founder of Charlton greyhound stadium at Charlton Cemetery earlier in the year, other than a thread on a Charlton Athletic message board which pinned the location down to roughly where Markro is now, I found very little in the way of recollections or even information – there is a bit more now on the fantastic Derelict London. Organised greyhound racing effectively started in 1926 at Belle Vue in Manchester, but Charlton was opened two years later by Thomas Murphy. At its peak, the sport had at least 16 greyhound tracks in London, in addition to Charlton, and the three other stadia Running Past has ‘visited’ at New Cross, Perry Hill and Catford, there were official tracks at Clapton, Hackney, Harringay, Hendon, Mitcham, Park Royal, Stamford Bridge, Wandsworth, Walthamstow, Wembley, West Ham, White City and Wimbledon; only the last of these remains. In addition to these there were two delightfully named ‘flapping’ tracks at Brixton and Southall – which were outside the control of the Greyhound Board. Five of them got into my store, and ate 28 lbs of biscuits. Eight of us, including two policemen, caught one, after three hours and after sifting two tons of oats. Then it escaped, arid we spent three and a half hours recapturing it. Bimbo, the drummer, managed to get as far as Rugby before being apprehended. Presumably Murphy felt that running dogs would be a little easier to manage than escaping monkeys. 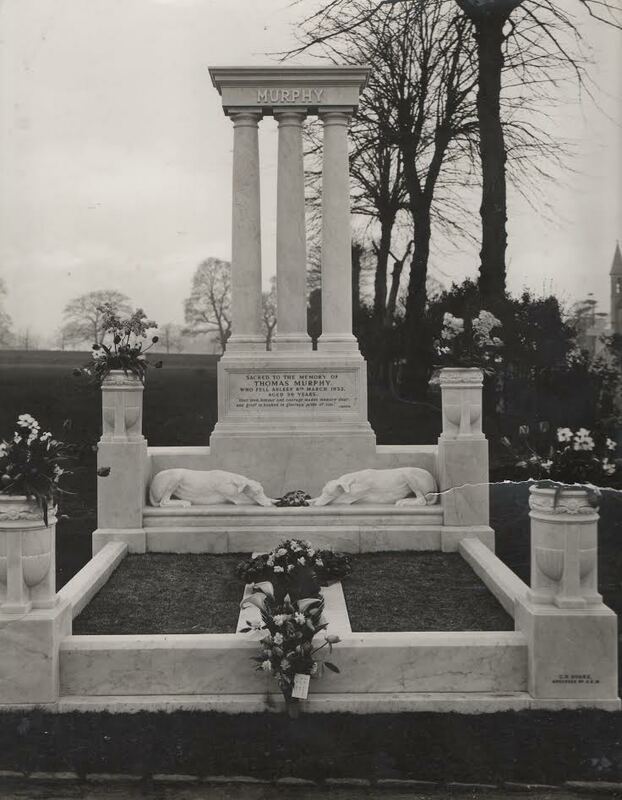 Sadly he only lived to see three or four years of racing in Charlton, he died in 1932 at just 39 and was buried at Charlton Cemetery, his large memorial having two life sized greyhounds at its foot. The top photo is of the grave just after the funeral (from Pat – see comments below) and shows how much the cemetery and that part of Charlton has changed. Ownership transferred a few years after Murphy’s death to Charlton Stadium (1936) Ltd – possibly suggesting that the original company set up by Thomas Murphy had got into finanical trouble after his death, the London Gazette just notes winding up. Racing continued during the War and meetings were advertised in the local press (1). The stadium was taken over by London Stadiums Ltd in 1946 – who also controlled the stadia at Wandsworth and Park Royal. 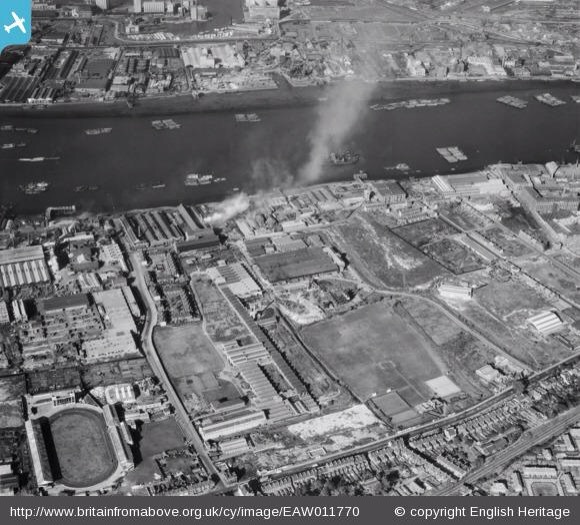 There are several aerial photographs from the following year from the excellent Britain from Above site with the stadium in the bottom left hand corner of the picture – with the Tote board clearly visible. There are a few other discernible landmarks along the bottom of the photograph too – the Antigallican, at the corner of Woolwich Road and Charlton Church Lane, and edge of The Valley in the bottom right hand corner (there is an adjacent and better photo of The Valley here), plus, I think, the edge of Charlton’s first ground, Siemens Meadow, in the top right hand corner. 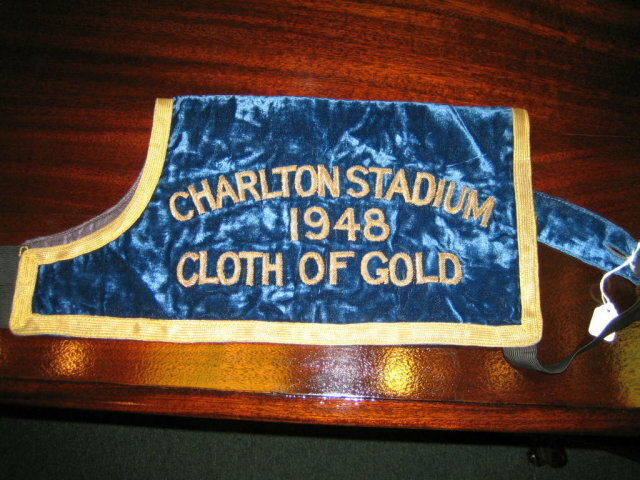 Charlton had two big annual races – the Cloth of Gold, which seems to have started in 1941, and the Olympic. The winner’s velvet coat form 1948, is currently (November 2014) on sale for $325 – other Cloths of Gold, sadly seem to be unavailable. As was the case at New Cross, the stadium was used for boxing during the 1930s with bouts on two separate occasions during July 1934. However, it doesn’t seem to have continued after that. Charlton also attempted to emulate New Cross in bringing Speedway to the stadium – however, attempts in 1938 and 1948 were turned down by the speedway governing body. A further attempt was made in the 1960s, but that came to nought as well. While betting had under-pinned greyhound racing from its beginnings, it also brought about its near extinction in London. The death knell for the sport came with the legalisation of betting shops in 1961. For Charlton it had an almost immediate impact with the track closing in 1962. 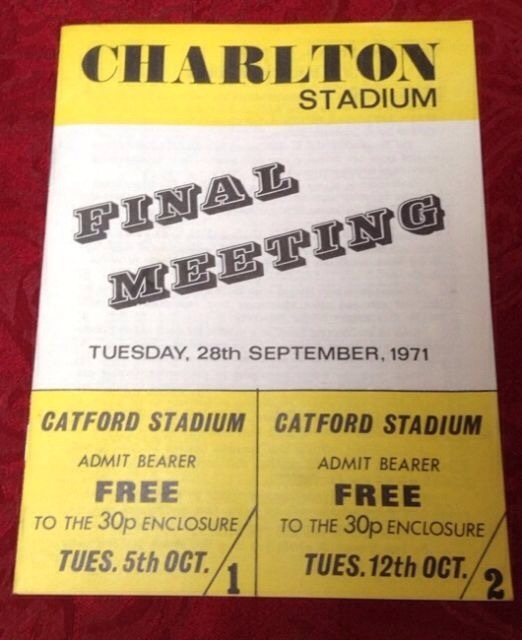 Whilst London Stadiums Ltd. eventually found someone to promote racing in 1966, the last ‘hare’ went around the track on 28 September 1971 and ‘punters’ were encouraged to continue betting with their Tuesday night gambling at Catford in the final programme (from e bay in early 2014). This entry was posted in Greenwich History, Lost Sports Stadia and tagged 178 Latimer Road, Charlton Greyhound Stadium, Escaping monkeys, Monkey jazz band, Thomas Murphy, thomas murphy monkey jazz band on November 19, 2014 by Paul B. My father had an allotment off Anchor and Hope Lane in the 1950s and early 60s which backed onto the charlton stadium. We could hear the dogs barking, but never saw them. Presumably, from the aerial photo, the allotments were behind the stadium, where the Makro car park is now. Thanks for your comment and visiting. 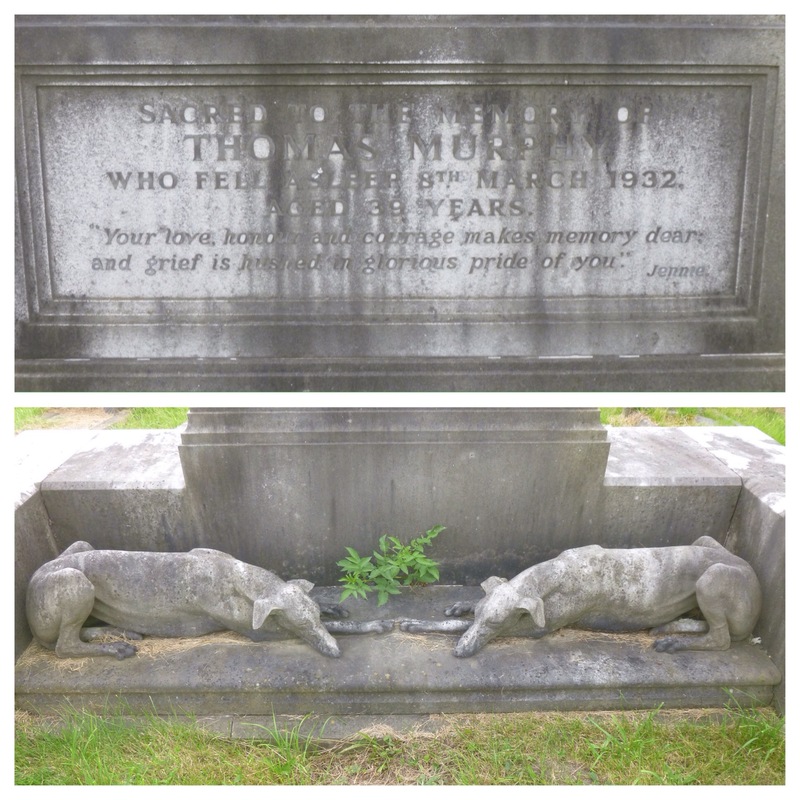 I lived in Wolverhampton but my mother was from Charlton and we used to come down to visit her parents grave which is very near to the Murphy grave and I always wondered and admired the greyhounds. My mum left London to marry Millwall keeper Malcolm Finlayson who was transferred to the great Wolves team. Sadly I am now returning to charlton cemetery to bury my mothers ashes and those of my brother in her parents grave. It is wonderful to know the history of the greyhound grave nearby! Thank you, Sandra. Thanks for visiting and commenting. Sorry to hear about the reasons for the visit. It is certainly an impressive grave and very different to all the other graves in Charlton Cemetery. Sandra, It was very sad to read about your visit to the cemetery. I come from Charlton and lived very close to it. I was very interested to see the mention of your father. I remember him from my very young days. He was a real old-fashioned football hero and a great goalkeeper. I wish you well. How interesting! Was Murphy from Newport too then? I don’t think that I ever found out anything of his family history, a combination of a common name and not being sure about locations. Thank you for your kind words about the post. 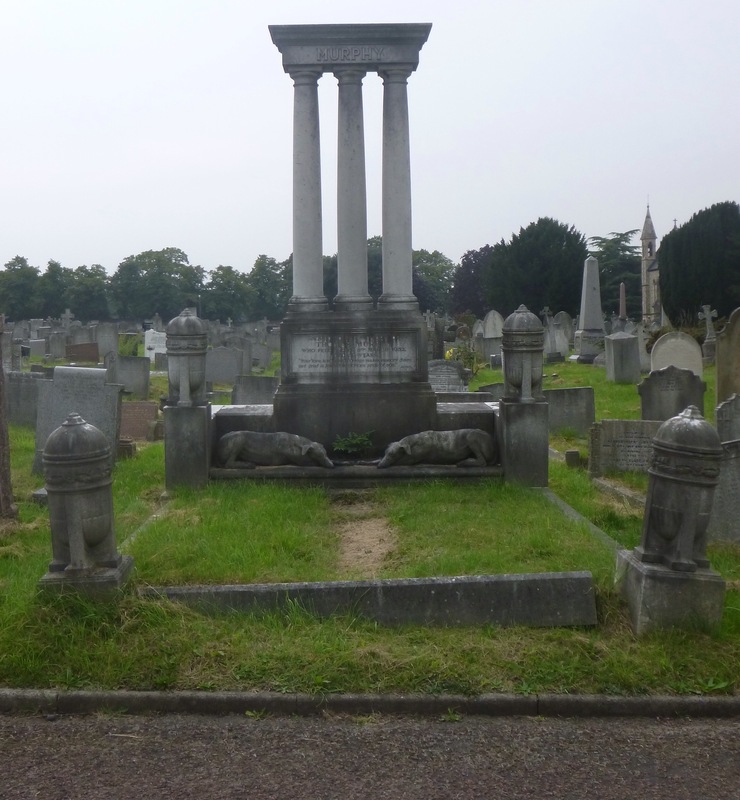 Oh yes, I would love to be able to add an early photograph of the grave to the post – I will e mail you. By the way, Thomas was featured on Robert Elms Show’s Notes and Queries on BBC Radio London a few months ago, mainly about the escaping monkeys! I’m doing my husband’s family research and just stumbled on this. Can I ask who Thomas parents were please?? His father was Thomas Murphy born 1866 in Glamorgan and his mother was Emily North born 1871 in Leicester. Thomas the son was born in Paisley. It was a large family, 10 children. As Thomas senior was also a showman the family travelled around and the older children were all born in different places but the two youngest ones, once Thomas made a career change and became a fishmonger, were born in Newport. Excellent, thank you! This is the Thomas I was looking for, my husband is a descendant of one of his younger brothers.